Deep frying basically involves immersing food in very hot oil, however there is indeed a right way to deep fry foods to get the best results. Jumia Food shares 6 common deep frying mistakes people make. The best and most appropriate oil to use for deep frying is one that has a high smoke point. The smoke point of oil is the temperature at which smoke starts to form and oil starts to break down. When oil breaks down, its quality and favour changes, this can then cause your food to have an unpleasant taste. Refined groundnut oil has a neutral flavour (which makes it unlikely to impart any unwanted flavour into your fried food) and it also has a high smoke point, which makes it one of the best oils to use for deep frying. Vegetable and sesame oils also have high smoke points that make them suitable for deep frying. Old oil can be used for deep frying but it is important that you first filter it. ‘Dirty’ oil typically results in food with a darker and ‘dirtier’ look, more greasy taste and might even end up making your fried food taste burnt, even though it might not actually be burnt. Additionally, it is also important to note that it is more appropriate to reuse oil that has been used to fry fish to fry seafood because the oil will be heavily laden with the fishy flavour. Avoid Frying at Too Low or Too High Temperatures For the best deep frying results, you will need to maintain a relatively steady high temperature between 325 – 390 degree Fahrenheit. If the temperature is too low, then the food will end up being soggy as too much oil would have seeped into the food making it practically impossible for the food to crisp properly. If the temperature is too high, you might end up with a food with burnt crust and an undercooked interior. So, you can clearly see that the oil temperature plays an important role in deep frying. Putting too much food in the fryer at the same time will end up interfering with the perfection and crispiness of your fried food. Overcrowding the oil causes the oil temperature to drop, causing it to take a while before it is able to rise up again. In that time, oil would have seeped into the food and you might eventually end up with a soggy food. It is best to deep fry in small batches and stir the food from time to time to prevent them from sticking together. The food would also be able to crisp properly. It is better to deep fry smaller cuts of food as that will provide the best results with a faster frying time, resulting in a crispy exterior and tender interior. When the food is in smaller cuts, it will be easier for the food to cook more uniformly. 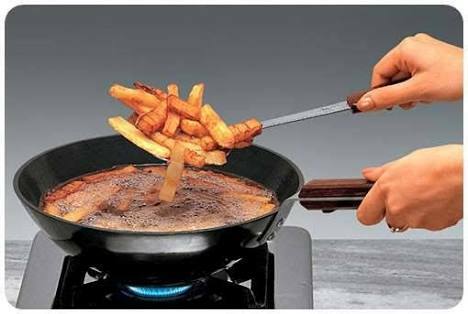 As much as possible try to remain where you are deep frying your food, please don’t walk away to answer a phone call or to attend to other house chores leaving the pot of oil unattended. This is because a grease fire can start in split seconds when the oil is over-heated, or the boiling hot oil can spill over and start a fire. This is why it is extremely important to be attentive and present when you are deep frying food.